If you or a loved one has been diagnosed with cancer, radiation treatments may offer hope. At Methodist Estabrook Cancer Center, our board-certified radiation oncologists use the latest technology to plan and deliver precise dosages of targeted radiation therapy to destroy cancer cells, shrink tumors or control progression of the disease. You are unique - and so is your cancer. We develop an individual treatment plan for each cancer survivor. Our radiation oncologists meet with a team of specialists to form your team and your treatment plan. This multidisciplinary team approach creates the best care for you and your recovery. The Methodist Hospital Radiation Oncology Department has been awarded a three-year term of accreditation in radiation oncology by the American College of Radiology (ACR). The ACR seal of accreditation represents the highest level of quality and patient safety. It is awarded only to facilities meeting specific practice guidelines and technical standards developed by ACR. 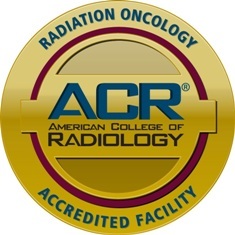 The accreditation is awarded only after a peer-review evaluation by board-certified radiation oncologists and medical physicists who are experts in the field.